Welcome to Week 3 of the iStyle series. I've teamed up with Clique Shops to bring you a series called How iStyle with Technology. Clique strongly believes that their Fashion Cases can transform an iPhone info a fashion accessory simply by coordinating your case with your outfit. They have partnered with outfit designers around the world to give inspiring outfit ideas to their customers. 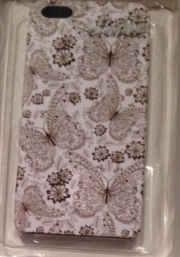 Their cases are for iPhone 4 & 5 as well as the iPad and iPad mini. They also just started offering cases for Samsung S4, S3, and S4 Mini. Since I have an iPhone I'll be focusing on those. So here are this weeks iStyle Looks! The theme of these looks is to use the case to compliment an outfit, even if the colors don't match. The look above ALMOST matches, but the gold on the case, is actually different from the beige on the Sweater, which is from TJ Maxx. The sweater color and the phone case are more neutral, so I decided to play up the striped pattern of the sweater, with a polka dot pattern on my Target Skinn Jeans! I call this look Free Spirit and I used the Freedom iPhone5 case. The second look is called Deep Girl, and I styled it with the Deep Pink iPhone5 Case. 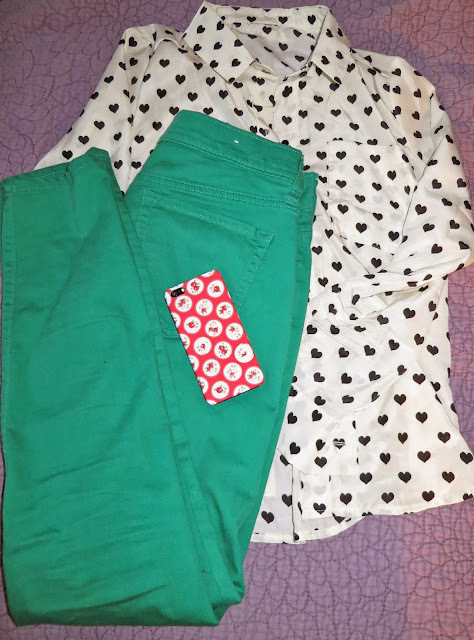 I decided to add some heart print pattern into this entire look with a blouse from Romwe and then used the flower theme of a green stem to choose the Old Navy green skinny jeans. Do you want to win one of these 2? Here's the Giveaway! I like the first one (freedom). I think it would go with just about any outfit! Thanks! ILike the Freedom case. I wear alot of neutral colors. I Didn't know my comment was doubling sorry. i like the pink one - i like mine bold, to stand out in a crowd!